Infallible Techie: How to set Assign using active assignment rules in Lead to true by default in Salesforce? How to set Assign using active assignment rules in Lead to true by default in Salesforce? 1. Go to the Laed page layout and edit it. 2. 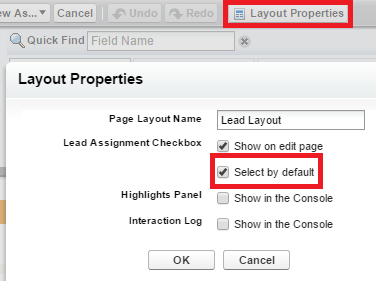 Click "Layout Properties" and set "Select by default" check box to true in Lead Assignment Checkbox. How to remove chatter in Salesforce? How to remove time from date Salesforce? Where Quote pdfs are stored in Salesforce? How to bookmark a post in Salesforce? How to verify Salesforce certification? How to get Session Id using Apex in Salesforce? How to add logo in Letter Head in Salesforce? How to get Salesforce organization id using apex? How to create Objects in Salesforce?